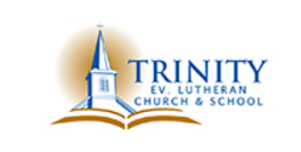 Trinity Lutheran Congregation began as a mission in 1856 by Pastor Ludwig Habel. He held services 4 times a year. That is how often the people communed each year. The land where the current parsonage stands was purchased and a log structure was built for use as a church and school. On the Sundays when the pastor was not available church officers conducted services. One layman who was noted as often conducting worship was Fredrick Gauger. The church was first named: Lutheran Community of the Triune God. A woman teacher was hired in autumn of the same year and was active in the school until 1880. In 1858 under the guidance of Pastor Ahner from Cedarburg, the congregation joined the Missouri Synod. The present church building was dedicated in 1879. It included a Christian Day School in the church basement. The current teacherage with five acres of land was purchased in 1887. The parsonage was built in 1895. Land for the church park and the cemetery on the south side of Pleasant Valley Rd. was purchased in 1902. 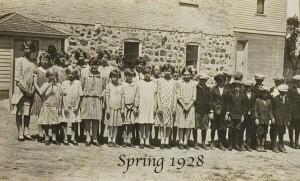 The Ladies Guild formed in 1920. They were a valuable addition to organizing and serving at many activities at Trinity. 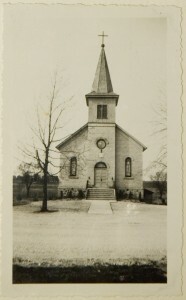 In 1927 an addition was constructed on the north end of the church, which is our current chancel and sacristy and on the lower floor and furnace room was added. Only German language was used in congregational worship services until 1936 when a monthly service in English was added to the worship schedule. By 1945, meeting minutes were written in English instead of German. The regular schedule of German services diminished gradually until ending in 1971. Indoor plumbing was installed in the parsonage in 1945 and in the church and school in 1952. The area where the church basement bathrooms are located had to hollowed out by hand. Increased enrollment in the Christian Day School resulted in the construction of two new classrooms. The building addition, which also included offices, fellowship room and kitchen, was dedicated May 18, 1958. In 1971 Trinity separated from the Lutheran Church-Missouri Synod, due to their practice of false doctrine. For a brief time it was independent, served by an ELS pastor from Watertown, WI. Later that year Trinity joined the Evangelical Lutheran Synod and Pastor Paul Anderson accepted the call to serve at Trinity. The Gymnasium-Fellowship Center, along with two classrooms, locker rooms and additional restrooms, was dedicated in 1989. Pre-school classes were begun in 1990 taught by Barb Speerschneider. The 135th anniversary celebration was held on October 20, 1991 with Rev. Paul Petersen, ELS vice-president preaching. The 150th anniversary celebration was held on October 22, 2006 with Rev. John Moldstad, ELS president preaching. Throughout its 160 years, Trinity has been seeking to serve our Lord by providing His Gospel to all our members, especially to our children, and to people in the community. We thank the members who compiled much of the historical information for the 125th, 135th and 150th anniversaries that was used for this historical outline.